Welcome to the Yakima Suite! Here is the view from the Ferry Landing Suites. An exterior view of the building. 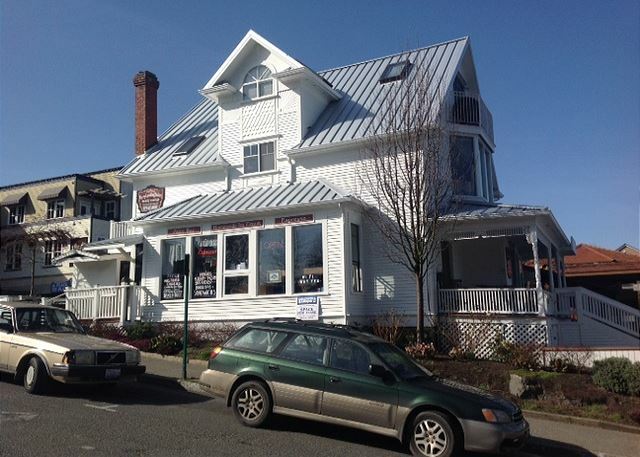 The suite is within walking distance to all of the wonderful restaurants and shops in Friday Harbor. A view of the building from the south side. From the entry, looking toward the french doors that open to the balcony. The entry, kitchenette, and table. 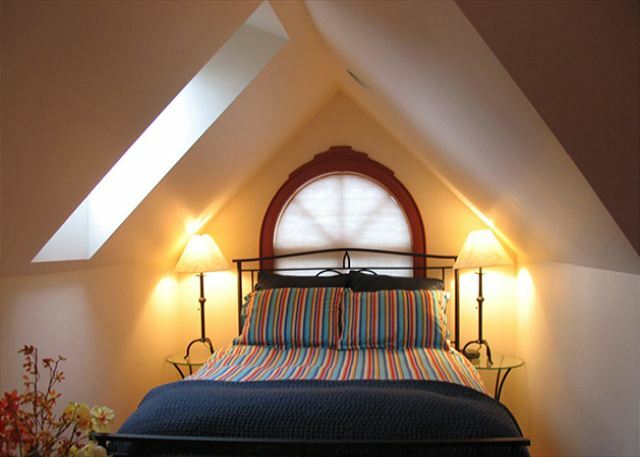 You'll sleep well in this romantic alcove with a skylight. Snuggle into the comfy sofa and watch the ferries slip in and out of the harbor. This was a mother-daughter vacation that couldn't have been more enchanting! Love the suite, the view and the island! It was a wonderful slice of Heaven! The Yakima Suite at Ferry Landing was extremely cozy. It had everything available to make for a relaxing stay. The Yakima suite was located on the third floor of a building just opposite the ferry landing. The room had amazing views of the whole harbor. When sitting on the couch you could watch TV, the harbor itself and the coming and goings of the ferry. The room was clean and comfortable, with quality bath products provided. The kitchen had a small fridge, toaster oven, coffee pot and any kitchen ware you may need. The bottom floor is a coffee shop with excellent pastries that we visited each morning. My husband and I loved the Yakima Suite from first sight and enjoyed our time there. It is on the third floor reached by stairs only. There is noise from the cars and trucks as they line up for the ferry across the street. Although this location meant we could get our car in line early and go back to the room to wait for boarding in comfort. We will definitely use this place in the future. We've stayed in the Yakima and Elwah suites before. We chose this stay to celebrate our 40th, because we love these rooms. Awesome views. Right in town. Amazing harbor and ferry views! Right in the heart of town with a great view and close to the Ferry for ease of getting to and from it. Great views and perfect spot for a little get away! I love the Ferry Landing Suites in general and the Yakima Suite in particular, and is always my first choice in Friday Harbor. It is absolutely central to all the activity but high above it, so that you get action and solitude at the same place and moment. Check-in is seamless; all my favorite places are within a block; two balconies for leisurely people/ferry watching; shuttle across the island to Roche Harbor is right outside the door. The best stay on the island. Beautiful view of Friday Harbor from both balconies. Well located with easy access to restaurants, activities and shopping. Easy to find, easy to park, everything was within walking distance. I loved it! Our car was almost towed away (with parking permit in plain sight) by the construction workers next door. We had a wonderful time on the island, loved the location plus having a parking space! what could we ask for? well maybe softer pillows! This studio apartment was perfect for the two of us. We really enjoyed seeing the daily action on the waterfront. Sitting inside or out we heard and saw it all. The kitchen facilities were fine for breakfast and lunch. Glad we had small suitcases since we had to climb to sets of stairs. The climb was worth the views. Location great for exploring the town, arriving by ferry or seaplane. We had an incredible time in Friday Harbor. The Yakima suite was beyond perfect. Great location- we sat with a bottle of wine on the balcony each night and watched the ferry boats. So close to everything- grocery, restaurants, shopping all within a 4 block radius of the suite. You won't be disappointed! We had a lovely stay in the Yakima Suite. It was convenient to everything and well appointed. Could have been cleaner but it didn't detract from our stay. This is a great place with the best views of Friday harbor and the comings and boings of the ferries! 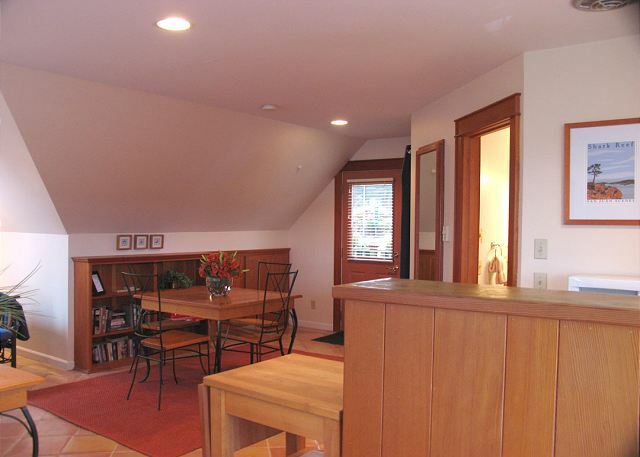 It's nicely equipped and decorated wth the best walking access to Friday harbor shops and restaurants.. I recommend staying here with 5 stars!! Our accommodation actually exceeded expectations, and I had very high expectations. Views were amazing night and day. I am so happy we stayed.. I totally recommend it. Would go back in a heartbeat. If you are considering a vacation that will include Friday Harbor on San Juan Island this exceptionally situated private suite is more than you can imagine. Location, location, location! We sat on our balcony facing the harbor and ferry landing every evening enjoying a bottle of wine from the wine store across the street. There are numerous restaurants and bars all within a 5 block easy walk. Everything on the island is easily accessible with a car. The suite is located above the Salty Fox, an awesome breakfast and lunch spot with naturally fresh selections to please every appetite. The suite was LARGE with a very comfortable queen bed off to the side. It's more like a flat (one large room) with a living area, dining area, bed area and bathroom. The bed was a queen and very comfortable. The living area faced the double doors to the patio and beyond the harbor view. We really enjoyed watching the seaplanes and ferries come in while we relaxed after a long day. The suite was immaculately clean with everything you need for a comfortable stay. Kitchen had everything you need for cooking at home; although no stove a good double burner hot plate was there that we used to steam fresh clams and mussels we bought from the farmers market on Saturday morning! There was a dining table with 4 chairs for full meals but our favorite was the bistro table with 2 chairs positioned right in front of a large port style window where we ate every evening when not enjoying the town restaurants. The bath had a walk-in shower that was HUGE. The location of the suite couldn’t be better. We had a rental car and drove to the alpaca farm, lavender farm, and various viewpoints along the water as well as we hoped a few ferries for day trips to Orcas and Shaw islands. This was by far one of the most comfortable accommodations we have ever stayed in. We loved this place! We were pleasantly surprised at how close it was to the ferry, how nice it was and how fun it was overall. The amenities were wonderful the location was right in the heart of everything and The views and the decks were excellent. We would definitely stay here again we loved every bit of it. The suite was very nicely furnished and comfortable. The view was a constant pleasure. The kitchen was adequate for making coffee or warming up take-out, but not much else. A bathtub would have been nice. I'd give it a 9 out of 10. My favorite place to sit and watch all the busy waterfront activities. 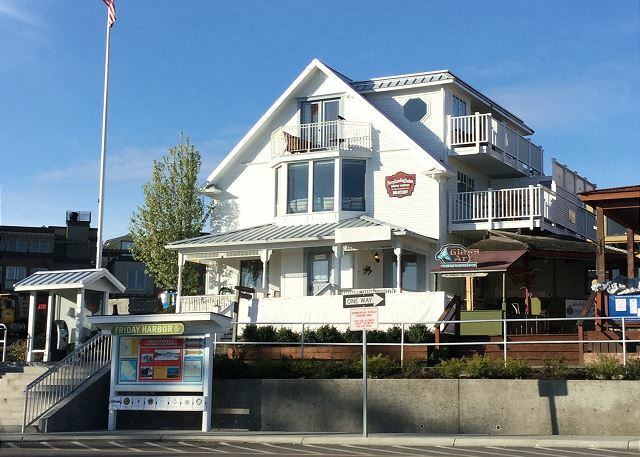 Leave the car in Anacortes, walk on the ferry, and walk across the street to your lodgings. One block to the best used-book store in the world, two blocks to the market, one block to the yarn store. Not sure it gets better than that. Great winter getaway if you like wet and windy! This is my fourth time here so that should say enough. Great in the winter as town is quiet but summer is busy and noisy late at night. Our second stay in this rental suite. Great view of the ferry activity and general low key bustle of the harbor. Walk to most everything and taxi available at ferry for excursions. We took one to Duck Soup Inn for Anniversary dinner. Suite was perfect. Wine on the deck with nighttime ferry coming in all lot up was cool. Will stay again. Easy logistics for rental company. Delightful. Superb location. Comfortable. Cozy. Perfect, the room offered us a beautiful view, open air, plenty of space and all the amenities of being home. My daughter and I stayed but did not cook however I plan on returning next summ with my husband for our 25th anniversary and I will use all there is to offer. Amazing is all I can say! Overall the rental met most of my expectations. The view from the balcony is as good as it gets in Friday harbor. The rental was clean and well stocked. Only things to watch out for are the worn out mattress and if the karaoke bar gets going next door you might have trouble sleeping. Love this place. Stayed many times before. Will stay again in the future. Only complaints, the floor could be cleaner (my feet were dirty after walking around on it) and it would be nice if there were a coffee scoop utensil. Hard to leave this special harbor view and go exploring. The ferries arriving and leaving are memorizing. You are eye to eye with the captain. Amazingly quiet with all the activity below. Clean, spacious, comfortable. Great place located near town. Incredible view of the harbor and ferry landing. Great for a small family who wants the convenience of being able to walk anywhere in town. Close to coffee, food and shops. The only thing I would recommend is a latch on the balcony door. I was traveling with a two year old who constantly wanted to walk out onto the front balcony. We had to obstruct for safety purposes. I will definitely stay here again. Place was great! No complaints except the room never got dark from all the outside lighting. I think it would help to have some over the alcove window that would provide better darkness. Otherwise clean, lovely and wonderful time. Fun location - lovely aparment! We has a great time on the Island and the rental proporty was wonderful. It was great to have a reserved parking space and the view of the harbor were fantistic. Initially we were concerned about noise but that proved not to be an issue. This being our first trip to San Juan Island, we decided to stay as close to the action as possible - you cannot get any closer than the ferry landing suites. 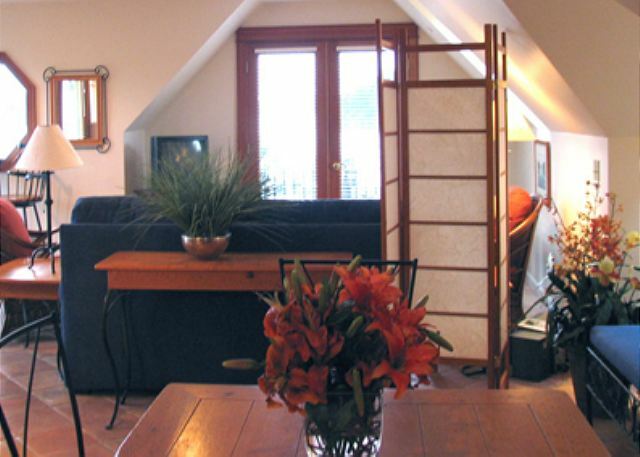 The suite was the perfect size for our family - two adults and two young children. It was also very clean and nicely decorated. We mostly ate at local restaurants, but used the small fridge and some of the dishes for snacks and drinks. We loved the view from the balcony and were within walking distance to everything in Friday Harbor. Coffee shops, restaurants, local artists and as much ice cream as you can handle are all very close by. My wife even ran at the local school track in the mornings. The big bonus of staying here is getting your car in line for the next departing ferry. This is very helpful in the summer when the ferry lines fill up quickly. I just watched from the suite while they loaded up the cars. Once they were all in, I drove around the block and was one of the first cars in line for the next ferry. After that, I went back inside to finish packing and have some coffee. We only had two minor issues. Due to this suite’s close proximity to some nearby restaurants, you will hear industrial noise (roof mounted exhaust systems, etc.) beginning around 6 a.m. and continuing all day until about 11 p.m. Also, since the ferry loads and unloads directly in front of the suite, you will get wind of exhaust from all cars and trucks (including large diesel delivery trucks). We were out most of the day, so not a big deal. But, the weather was warm when we stayed here and having the windows open for the breeze at times was a necessity. We love San Juan Island! The location of our rental unit was perfect! And it was perfect for us! Just enough space! Better pillows would be great and lighter weight blankets. Otherwise no complaints. Had a great time. Will be back soon. Later check out time like noon would be ideal. Nice location and view. Like other comments I don't get the lack of hot water. There's a coffee shop and kitchen on the bottom floor of the building so I know they must have hot water. Buck up and spend a couple of dollars on providing your paying guests with a decent shower. A great place to stay compared to other options on the island in this price range. Will never stay anywhere else in Friday Harbor! I just returned from spending 2 nights at the Yakima Suite in Friday Harbor... what a fantastic place! My best friend was visiting from out of town and I wanted to take her up to the San Juan Islands. Having been to the islands before, I've stayed at a few different places... the Yakima Suite is, by far, my favorite! The best location... directly across from the ferry landing. Amazing views of the entire harbor. Great amenities and very clean. We both loved it & considered it the highlight of our little getaway! the studio was not cleaned at our 4 pm arrival time. We reached the manager and he arranged the cleaning within an hour. There was not an instruction sheet or book for the studio. We really enjoyed the Yakima suite...especially the location. We could watch the ferry boat traffic come and go all day! We will love to stay there again! Great spot to watch the ferries come and go right from your own living room. Phone died, office replaced it immediately. It was clean and nicely decorated. Could use more hangers in the closet and a plug for the kitchen sink that fits; however, you won't sweat the small stuff in this great location. Stairs might be a problem for some. I would definitely recommend this suite and I look forward to staying there again! The property is what we return to each year for the past 3 years. we love it and the location. 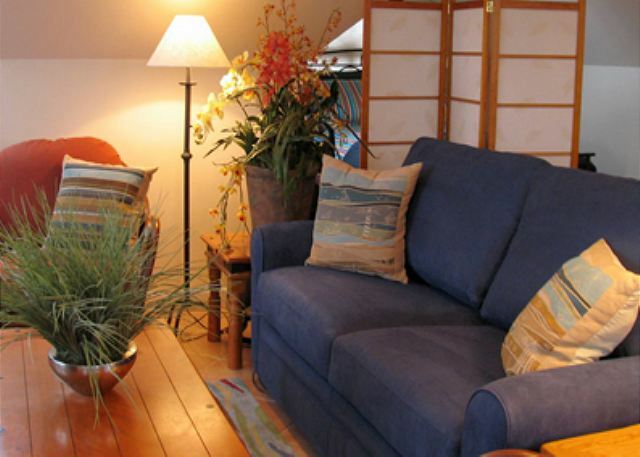 The Yakima Suite is probably the best secret in Friday Harbor. 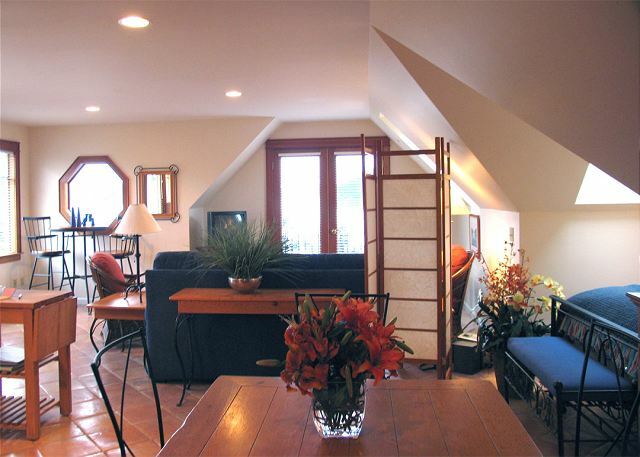 Its less expensive than other places and is right on the water - overlooking the harbor. This was a our second time staying there and really, that's the only place we'd stay in FH. Highly suggest staying there. Perfect location, beautiful and quaint place to stay!! Perfect place to stay on San Juan. The Yakima Suite was perfect for my daughter and I. We were able to walk everywhere. It was a beautiful, quaint place, we were sad to leave! The location couldn't be better - great place to watch the world go by and convenient to other places to go , eat, etc. This is the 3 rd time I have stayed there. FYI: One of the light bulbs was out in the living room lamps. Overall, we love our stay here every time -- best location and great accommodations!